After all, the critical top 5 things — a wide-screen TV, a wetbar, pool table, surround sound and games — are pretty well set in stone and seem to be non-negotiable. As it turns out, though, it’s a little more involved and complex than you might think. At least, if you want to make your man-cave the most popular one in the neighborhood. First, let’s touch on those five immutable elements, then we’ll discuss themes and materials. 1. Widescreen TV — There are LCD TVs, LED TVs, OLED TVs and Plasma TVs. They’ve all got their pros and cons, so you’ll want to figure out what you want most out of your TV before you buy. Keep your seating in mind as well. LCDs don’t look all that great if you aren’t sitting directly in front of them. OLEDs are curved. If you have lots of company on game day, the curved picture will look better from a greater range of view. Then there’s the budget. LCDs and Plasmas are reasonable. OLED is the new kid on the block and can be a budget buster. Now, when you’re talking TVs, size really does matter. You will probably be guided by wall size and budget, but don’t forget structural constraints. If you want to hang that brand new 90″ Plasma tv on the wall, you might want to consider some extra support. Drywall only holds so much and if your studs aren’t in the right place, your TV could end up on the floor. Then you have big holes in the wall, your new tile floor is broken and your awesome TV is busted. Not the outcome you were looking for! 2. Wetbar — Sounds like a lot of fun, right? A bunch of guys getting together to watch the game, drink some beer (or other libation) and have a blast. A well-appointed wet bar is a must-have. Now, your wet bar must be “wet.” So, more than likely you are looking at some of your hard earned bucks going to a plumber, in addition to the cabinet guy and the granite countertop guy. It wouldn’t be a wet bar without a refrigerator. You want a kegerator you say? Add an electrician to the list because the keg has to stay cool. (TIP: remember to clean the lines after every keg.) Another great accessory is an ice maker. Let’s face it… if you run out of ice in the middle of the game — well, that’s never good. 3. Pool Table — Seriously, who doesn’t want a nice full-size regulation pool table with green, red or blue billiard cloth covering real slate, and leather ball pockets with tassels? Everyone loves the chalk squeaking when you put it on the end of the cue, the crack of the balls on the break, and the groans of a missed shot. What a great idea! Your space and/or your budget is a little small and can’t accommodate the whole enchilada, you say? Fear not! There are smaller size pool tables out there, and if walls are an issue, smaller cue sticks are also available. If you’re more about the fun and games and not so much about slate and leather, you might want to take a look at combo tables. These have a pool table on the bottom and can be covered with a ping pong or an air hockey table top. Two for the price of one — how cool is that? Now don’t forget — when you have a pool table you need to think about the floor. Pool tables need to be level. That might be hard to do on carpet. A nice smooth natural stone or tile floor would be just the thing! 4. Surround Sound — Surely with all the time and effort you’ve put into your perfect cave, you aren’t just going to hang a couple of speakers on the wall and call it a day? Thinking this through as a part of your renovation rather than as an afterthought can bring great results. Why not have speakers inset in the ceiling behind the seating area for better sound effects. Better yet —set a few speakers into the floor between your comfy viewing- hairs in the seating area and let the sound come from every direction. Awesome! 5. Games — In this day and age, the predominant default when someone says “games” is probably the drool-worthy fantasy of playing your favorite online or digital games on a screen the size of the entire wall, but “games” is actually a much wider category! Consider a couple of free standing retro games like Pac-Man and Donkey Kong, or maybe a couple of pinball machines. After all, there is nothing wrong with Old School. If you like your games without flashing lights and electronic sound effects, you could also get a game table for poker or other card games. (Remember that combo pool table? I expect they’ve got a table top for card games, too.) And, don’t forget a dart board cabinet to hang on the wall. You can open it up to play, close it up when you’re done, and everything stores conveniently inside. You have the basics. Now let’s work on the flair. What is going to set “your cave” apart from everyone else’s? Work your passion into the presentation. How about a deer head or a bear head or, if you hunt big game, a lion or tiger? Show off your guns with gun racks and give your cave a country look with some rustic wood or unfilled travertine panelling and flooring. Or, have one wall painted as a forest scene to drive your theme home. Show off those fish you catch. Mount them on the walls and show off your poles with wall hooks. Drape a wall in fishing net or hang a small flat bottom boat on the wall for a great conversation piece. Again, travertine, rustic wood panelling or a combination of both will emphasize the rustic feel. If you want to step it up a notch, a rustic room is the perfect place to add a soapstone wet-bar top and wainscoting. As the main image on pg.23 shows - understatedly, compared to some we’ve seen - sports memorabilia is off the charts as far as themes go. Autographed footballs and baseballs and bats are just the tip of the iceberg. You can hang team-specific flags, jerseys and posters everywhere. Show off a signed fire suit from your favorite NASCAR driver or a signed hockey puck and stick from your favorite hockey player. Consider team glasses at the wet bar with team taps, towels, coasters, plates, bowls and cutlery. For fun, see if you can match a granite wet-bar countertop and your tile floor to your team colors as well. Go all out with team furniture and fatheads on the walls. Create a special place to show off your autographs from team members past and present. The sky’s the limit. Do you love a good cigar and stimulating conversation? Create a specialized smoking area with white marble floors, terrific wing chairs and a very quiet smoke extractor. (You might want one of those over the poker table also!) Keep some smoking jackets on hand for your friends as well. Are you a collector (of anything)? This is your place to show it off. Book collector? Create wall-to-wall bookcases. Wine collector? Create a wine wall with wine racks for everyone to see, plus a wine refrigerator in the bar and some specialized wine glasses. Are you a music aficionado? Sound proof your walls and tap into your state-of-the-art sound system, then relax and listen to your favorite artists. Or find an old juke box that works and show off your 45s collection. Find a vintage stereo and listen to your old vinyl LPs. Are cars in your blood? Create a speciality sofa from a car bumper. Get chairs that mimic the seats from a 1966 Ford Mustang. Hang stick shifts and license plates on the walls as well as car emblems. Old dashboards and car hoods are stunning wall hangings and conversation pieces. …get an actuator for your TV and store it up by the ceiling when not in use. And then, impress the hell out of your friends when you hit the remote and the TV slowly makes its entrance into the room from above. Another way to show off your personality is the floor you choose. Carpet will stain and it might be difficult to level a pool table on it. If you or any of your friends smoke, there could be the occasional burn mark as well. Hardwood floors require maintenance and may be difficult to upkeep. Tile may be the answer to your floor. Tile is available in a wide variety of colors and sizes and can be mixed and matched into infinite patterns. But best of all, tile is a great companion to warm floor. Warm floor is basically a system of mats with electrical wires running through them. It is rolled out and hooked to a thermostat. Tile can then be laid over it. No more cold tile on your bare feet and let’s face it, a lot of man-caves are built in basements. Basements are notorious for being chilly. A little extra heat never hurt anybody. Granite or marble? Travertine or sandstone? Something even more unique like onyx? Whatever stone you choose - though certain types are more appropriate for some applications than for others - in addition to your floor and wet-bar countertop, natural stone can be used in a variety of places. You can wrap your wet-bar in stone as well, matching or complementary. Use it for shelves and furniture toppers. Granite, due to its hard and acid-resistant nature, is great for making tables. You can have an awesome game of poker on a granite table. If you’re worried about maintenance or staining, have your fabricator or stone care professional use a 15-year sealer on your stone when appropriate. This will help to cut down on both. We’ve talked alot about fancy and extravagant man-caves, but don’t be disappointed if your budget or your space is small. Chances are you already have items that will make your small retreat a perfect spot for decompression and relaxation in a place all to yourself. Rescue that chair you love that your housemates are always threatening to do away with when you’re not looking. Unpack that collection of memorabilia or model airplanes, mementos of past accomplishments or your elephant collection and dinosaur figurines— whatever you’d like to be surrounded by. The point here is to make your cave as personal to you as possible. One of the main reasons people begin to consider a man-cave is a need for a place to relax and recharge away from everybody else, a place to go if you need to think something over, or if you just want to mindlessly watch TV for a bit, or put in that movie that only you of the entire family understand or love. It’s your space, your vision and your dream, and ultimately the only person that REALLY has to love it is you! 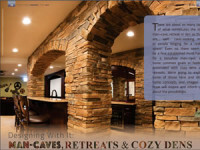 This article is published in Stone Advisory Magazine – Spring 2015 issue.